Academic conferences (gakujutsu taikai 学術大会) are a venue for our organization’s members to present the results of their most recent research to the world. Conferences also act as a place to gather under one roof to network and build relationships among fellow researchers in Buddhist Studies and Indian Studies. At the present, conferences are held once annually, with the dates and location decided by the host institution at the previous years’ board meeting. Host institutions are chosen from among our affiliated schools and organizations. Conferences are held at the chosen host institution, but up until now, the host institution has been chosen to so that the conference location alternates between affiliated schools located to north of Kantō (the Greater Tokyo area), and schools located to the west of the Kantō area. Presentation of research to the public is done through the publication of an official association journal, the publication of a history of the academic organization, the Indian and Buddhist Studies Treatise Database (Abbreviated INBUDS), and the Taishō Shinshū Daizōkyō Text Database (Abbreviated SAT). The official journal of our organization is The Journal of Indian and Buddhist Studies (JIBS, or Indogaku Bukkyōgaku kenkyū 印度學佛教學研究), which carries articles that present the results of our members’ latest research, and is published twice annually. Articles submitted to the journal are evaluated through a peer-review process, and after passing through a first reading by a board of referees, are reviewed by the journal’s editorial committee in order to determine whether or not they should be published. As of March 2014, Our journal is currently in the third issue of volume 62, with 133 issues in total. Four compilations of our organization’s history have been published up to this point: Gakkai Go-nen no Ayumi 学会五年の歩み (“Five Years of the JAIBS,” published in 1957), Gakkai Shichi-nen no Ayumi 学会７年の歩み (“Seven Years of the JAIBS”) Special supplementary issue (1951–1958) (published in 1958), Gakkai Jū-nen no Ayumi 学会十年の歩み (“Ten Years of the JAIBS,” published 1961), and Gakkai no Ayumi: Jū-nen Jūsan-nen no Ayumi 学会の歩み: 十年－十三年の歩み (“Association History at Ten and Thirteen Years,” published 1965). Next, as a means to present the results of research, we operate the Indian and Buddhist Studies Treatise Database (Indogaku Bukkyōgaku Ronbun Dētabēsu インド学仏教学論文データベース) or INBUDS. This database is a compilation of articles related to Indian Studies and Buddhist Studies, which can be searched either by keywords taken from each article, or according to author. This database was first put together on an experimental basis in 1984 (the 59th year of the Shōwa era) under the guidance of past director Hirakawa Akira 平川彰, out of keywords taken from volumes of the organization’s official journal, JIBS, published up to 1984. Then, in 1988 (the 63rd year of the Shōwa era), the association set up the Konpyūta Riyō Iinkai コンピュータ利用委員会 (Committee on the Use of Computers) to examine the potential for using computers for Indian and Buddhist Studies, and decided to create the Indian and Buddhist Studies Treatise Database (abbreviated INBUDS). In the following year, the Association opened its Database Center and formally began the work of building the database. With the cooperating and assistance for data-entry from forty-four universities and research institutions throughout Japan, the database came to include over one hundred and ninety journals and annual reports—work which continues to this day. At present, INBUDS operates under the condition that it is publicly available and open to anyone, and can be accessed and searched online from the website of the Japanese Association of Indian and Buddhist Studies Database Center. The construction of this database is funded by a “Grant-in-Aid for Publication of Scientific Research Results” (Kagaku kenkyūhi hojokin kenkyū seika kōkai sokushinhi 科学研究費補助金研究成果公開促進費) from the Japanese Society for the Promotion of Science (JSPS, or the Nihon Gakujutsu Shinkōkai 日本学術振興会), as well as by the annual support of its parent organization (the JAIBS), however, we also welcome donations from members of the public who appreciate this project. The Taishō Shinshū Daizōkyō 大正新脩大蔵経 (also known as the Taishō Canon) is one of the largest collections of East-Asian Buddhist texts, known worldwide for having been compiled in Japan. 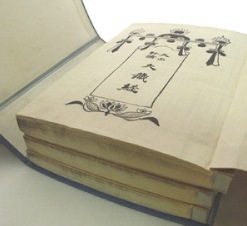 Totaling one hundred volumes, including the fifteen volumes of the Images Section (zuzōbu 図像部), with each volume averaging one thousand pages, and each page typeset into three horizontal rows, the Taishō Canon was produced based on the the Korean Buddhist Canon (Jp. Kōrai Daizōkyō 高麗大蔵経, also known as the Goryeo Tripiṭaka or the Tripiṭaka Koreana), and then compared against three Chinese editions from the Song dynasty, the Yuan dynasty, and the Ming dynasty, the Shōsōin Shōgozō 正倉院聖語蔵 Edition (from Tōdaiji 東大寺 in Nara, Japan), the Kunaishō Zushoryō 宮内省図書寮 Edition (from the library of the Japanese Imperial Household), as well as various manuscripts and other texts. To this day, the Taishō Canon is the international standard used when referencing classical East Asian Buddhist literature. Although the Taishō Shinshū Daizōkyō was first compiled by Takakusu Junjirō 高楠順次郎 and Watanabe Kaikyoku 渡邊海旭 from 1924 (the 13th year of the Taishō era, hence the word “Taishō” in the title) to 1934 (the 9th year of the Shōwa era), the text of this canon has been digitized to meet the needs of the modern Heisei era, thus, the work of the Taishō Shinshū Daizōkyō Text Database project began with the intention to compile and edit what might be called a “Heisei Shinshū Daizōkyō” 平成新脩大蔵経 (i.e., a Canon of East Asian Buddhist Texts for the Modern Heisei Era). We live in a time where, not only East Asian Buddhist Texts, but any documents that had once been written on paper and other media are able to be handled by computers, and are one by one becoming digitized. Looking at Buddhist texts in the rest of Asia, our neighbor Korea has already completely digitized their Tripiṭaka Koreana, while Taiwan has, naturally, done the same to make progress on a project to digitize the Taishō Shinshū Daizōkyō. Even in Japan, researchers using computers were doing text entry and creating digitized texts on their own from an early stage, which would then be used by themselves or a few fellow researchers. It was under these circumstances that, at the same time the world of academic Indian Studies and Buddhist Studies was beginning to recognize the need to build, both systematically and collaboratively, a text database of the Taishō Canon, the opportunity to start such a project came to the fore, and in 1994 (the 6th year of the Heisei era), with the approval of the Japanese Association for Indian and Buddhist Studies (Chaired at the time by Maeda Sengaku 前田專學), The Daizōkyō Text Database Research Group was created, represented by the late University of Tokyo professor Ejima Yasunori 江島惠教. From there, the project to create a text database of the Taishō Canon proceeded as part of the The Daizōkyō Text Database Research Group. Through this chain of events, although our organization, the JAIBS, retains a separate budget, The Daizōkyō Text Database Research Group operates through the support of our organization, and is considered part our association’s sphere of interest. The actual work of creating the database has moved forward through a relationship with the organization responsible for Taiwan’s Buddhist text digitization project, the Chinese Buddhist Electronic Text Association (CBETA, Ch. Zhonghua Dianzi Fodian Jiaohui 中華電子佛典協會), who continues to cooperate with us on all accounts, from technical expertise to data entry work, as well as through the data entry work done at the International Research Institute for Zen Buddhism (IRIZ, or the Kokusai Zengaku Kenkyūsho 国際禅学研究所) at Hanazono University, who has provided us with data for texts specific to the Zen tradition. Up until this point, this project has operated through public grants such as those from the Japanese Ministry of Education, Science and Technology (MEXT), through the generous support of our members, and through the donations of interested members of the general public who recognize the significance of this project. However, this project requires a great deal of funding to operate, and in the year 2000 (the 12th year of the Heisei era), with the aid of the Bukkyō Gakujutsu Shinkōkai 仏教学術振興会 (The Society for the Promotion of Buddhist Studies, Chaired at the time by Sakurai Hideo 櫻井秀雄), we received assistance from the various sects and sub-sects of the community of Japanese Buddhists to create The Daizōkyō Text Database Foundation (Nara Yasuaki 奈良康明, Director), which now acts as the financial support for this project. Now, the entire text of the Taishō Canon, volumes one through eighty-five, is available to the public through the website of the The Daizōkyō Text Database Research Group (SAT), where it can be accessed by anyone in the world. Through this website, users are able to search through the entire text data, and multiple texts can be easily compared side-by-side. As a resource for Indian Studies, Buddhist Studies, and East Asian Studies the world over, the project to digitize the Taishō Shinshū Daizōkyō will of great significance for years to come. Please contact the main office of the JAIBS before reprinting, copying, or reproducing any documents, text, or images from this website. Copyright © 2012–2018 The Japanese Association of Indian and Buddhist Studies (JAIBS, Nihon Indogaku Bukkyō Gakkai 日本印度学仏教学会). All rights reserved.